Máire's classic 1985 album. It represented the first outing on record for the "traditional style" which she had invented for the Irish harp. FOLK ON TAP "One of the loveliest albums for many a year...if you have tears to shed, prepare to shed them...The Celtic harp is not generally associated with the dancing rhythms of the reel and the hornpipe...but in Ms Ní Chathasaigh's nimble fingers the already rapid fountain of notes is further embellished by an astonishing display of decorative 'grace notes' - the sort of thing you hear in the ornate singing of the best of West of Ireland voices. The whole album is practically faultless...a glorious record." THE CORK EVENING ECHO "Every now and then an Irish traditional record of spirit-saving proportions is released. Máire Ní Chathasaigh's debut album is one of these. It is an intensely passionate and intelligent record. Her academic approach to arrangements could have made a lesser musician seem wooden or stagnant. However, Ms Ní Chathasaigh's attitude is that of a loving perfectionist, not that of a pedant. The subtle variations in each section of most pieces reflects her thoughtful perspective and individuality. Three songs are included and in one of these, The Bantry Girls' Lament, she is joined by her sister, Nollaig, whose beautifully full sounding violin adds a richness to the song that others who have recorded it must envy. Throughout, Nollaig Ní Chathasaigh's contribution soars eloquently and it is one of the reasons that this record has a textural character all of its own. There are the almost mandatory O' Carolan pieces, and one of these Planxty Sudley is wonderfully expansive. Máire plays harp and synthesiser and Nollaig adds violin. Together they manage to produce an almost chamber orchestra-like sound. Ní Chathasaigh plays Carolan's Farewell to Music with a control and emotion that makes The New Strung Harp a milestone in Irish harp music." FOLK ROOTS No chance of your mind wandering while Máire Ní Chathasaigh is performing. So intricate are her techniques, so subtle her use of tonal lights and shades, so inventive her arrangements that your attention is not so much caught as captivated. She has a style all of her own but which is ideally suited to the resonances of the Irish harp. Her method of ornamentation by the nimble repetition of notes adds an exhilarating skip and vigour to jigs like 'Father Hanly' and reels like The Pullet. She's not only good at rattling off dance tunes either. Her control and timing on the five minute track An Spéic Seoigheach is spellbinding as is her interpretation of Carolan's Farewell to Music. Her arrangement of the latter is so sparse that on first hearing I wasn't too sure about it but further listens have proved the old adage about the spaces between the notes being as important as the notes themselves. Every string is in sympathy with the mood of the piece, an interpretation of considerable maturity from one so young. There are two other O'Carolan tunes on The New Strung Harp which receive the more conventional baroque treatment although the synthesised bass ground and her sister Nollaig's fiddle on Planxty Sudley are far from ordinary and provide a fitting climax to side two. All that plus three songs, one in English, two in Gaelic, sung à la Clannad make this a truly beautiful album." IN DUBLIN Irish harp music is currently undergoing something of a renaissance. Through its symbolic associations, the instrument was for long a token tourist attraction, most popularly perceived as an appendage to 'medieval' dollargathering and generally played by what Chris Warren once referred to as 'harpies in white nighties'. Popular acceptance of quality playing began perhaps with Derek Bell's recruitment to the Chieftains, and there is now quite a number of harpists who perform native music excellently. 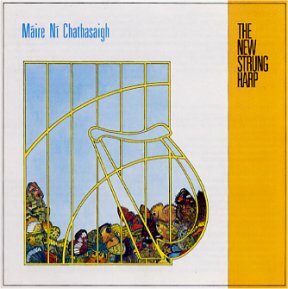 The New Strung Harp by Máire Ní Chathasaigh is a showcase for the talents of one of the very best of these. Máire is already deservedly well-known for her live performances, and on this disc presents thirteen items, ranging from classic eighteenth century pieces to a street ballad. The variety is one of the attractions of the album: the instrument has long been used for the more lushly baroque of O'Carolan's pieces and the famous Moore's Melodies, but its use for the common people's dance tunes is a more recent innovation. How excellently it can suit them is shown here - throughout her dance tunes, Máire uses traditional techniques, particularly those of the pipes. This is no slight on her own instrument; rather it's an acknowledgement of how these tunes developed within the tradition and of the adaptability of the harp. In this respect she would have had little enough of a precedent, so it's also a considerable tribute to her talents as musician and arranger. The older music is also abundant. There are four of Carolan's pieces, covering a range from the elegance of 'Planxty Sudley' to the more gauntly native Farewell to Music. The classic harp tradition is represented by An Spéic Seoigheach from Bunting's collection, and there are some beautifully arranged songs. Máire's own sleeve notes will add considerably to the reader's knowledge, and they're not the least notable of the record's attractions. In all, the album is a labour of love and a joy to the listener." THE SCOTSMAN "An album of harp music that unquestionably deserves to be hailed as a classic exercise in music-making." TAPLAS "I must congratulate everyone connected with the making of this marvellous album; Temple Records for bringing out another classic to add to their collection, Robin Morton for a masterly piece of production and, last but by no means least, Máire Ní Chathasaigh herself for a work of art which is, amazingly, her first solo album. I hadn't been familiar with Máire's music before, but I had been told by friends to expect something extraordinary. This is the harp album I've been waiting for. I've always been fond of harps and harping, but have complained in the past that most folk harp records give the impression that harps were meant primarily for the playing of slow airs. This is, of course, not true. In Wales the harp was once the main instrument for dance and in Ireland the style of the old harpers was supposed to have been unusually quick and lively. This album has everything, from lively jigs and reels to slow airs and some of the best Gaelic singing you are ever likely to hear. There is a virtuoso rendition of what has long been my favourite jig, 'The Humours of Ballyloughlin'; there are O'Carolan tunes, including lively ones like Charles O'Connor and slow ones like Carolan's Farewell to Music; there is a hornpipe set which I can't get out of my head, despite the fact that I've known both tunes - The Fisherman's Hornpipe and The Cuckoo's Nest - for years without the least problem. I even found myself playing the latter last night and, without realising it, trying to fit in some of Máire's harp variations and ornaments on the fiddle. I kept wondering why I was grinding to a halt! As well as Máire's harp playing, her lovely voice and some very tastefully - that is, sparingly - used synthesiser, we also get a sizeable portion of the rest of her family. Although, as I said earlier, I had been unfamiliar with Máire's playing until now, I have been an admirer of her sister Nollaig's fiddle playing for some years, ever since I first heard it on an album I picked up in Killarney by Danny Doyle, called The Highwayman. One of the most notable things about Nollaig's playing is the feel of 'swing' which is there even on slow numbers such as the last track on this album, O'Carolan's Planxty Sudley. Two other members of Máire's family are also on the album - her other sister Mairéad and her brother Greg, both of whom sing harmonies. Mairéad also plays tin whistle on the second track, a beautiful Gaelic song Ó ho nIghean, É ho hIghean. I really can't write any more about this lovely album. In the words of a friend of mine, 'What can you say about it? It's perfect.'"